The sound of Orcs assembling in the Gorj pass and rumours of their scouts raiding the outlying communities strikes fear into the hearts the sheppards and farmers in the north of Tria Nomina. Where is the army to defend them!? Not there! As spring approaches the Legions of the Imperiator parade in streets of Praenomen in their finest and receive blessing from the priests at the Temple of Mars. The hammering of the Dwarven armourers rings throughout their mountain fastnesses. Weapons are honed to a keen sharpness and the warriors are called to arms at the sounding of the Great Horn of Ghillebrae. 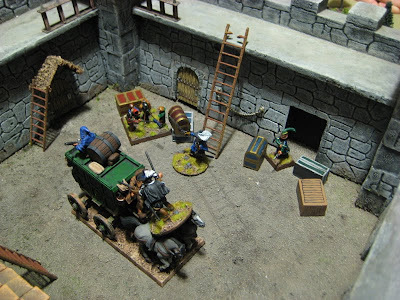 The people of Ronarok look to their defences, repairing the walls of their fortified towns and stowing supplies in deep cellars. 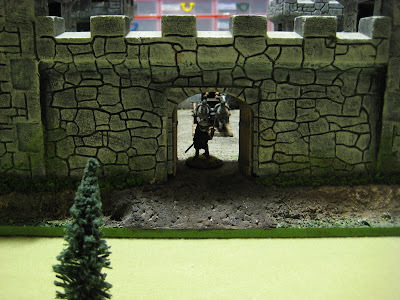 The Hird rallies to the Raven Banner of King Ingvar behind the great walls of Ludharn. In the south, great columns of dust rise high into the sky as great masses of warriors and beasts march across the steppes of Grummsh and fertile plains in the lands of the Sapphic League. 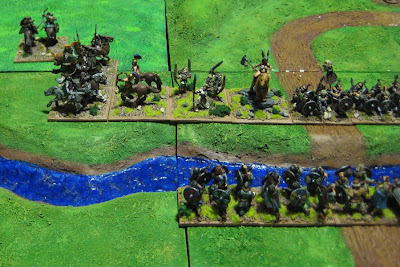 Orcs accumulate at Otisburg in ominous numbers, while the Warrior women collect at Beauvoir. It seems almost certain the sands will soon be stained with blood! The Ilfarien look out over the tumultuous waters surrounding their fair isles with a serene calmness. The fleet and army assemble at Dyledele, but will they sail? Will they intervene in the coming conflict or will they let the baser races fight it out amongst themselves? Head(s) of State: Myrah the Mighty, Chairperson of the Council of Empowerment of the Sapphic League of Unity and Togetherness. 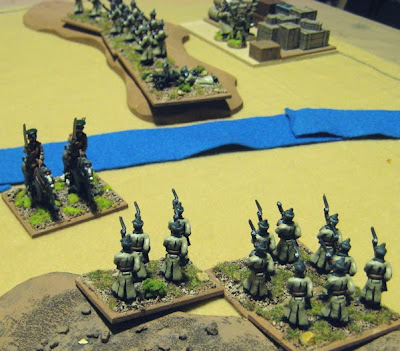 It’s been a month since I’ve played any Modern-ish DBA and with the October Camapign Weekend rapidly approaching I thought we’d best do some more play-testing and get the rules and forces hammered out. This time, just as the last game Riak and I got to gether and tried out a game on a DBA “25mm standard” 3’x3 board with 12 stands. …these seemes to work out fine. 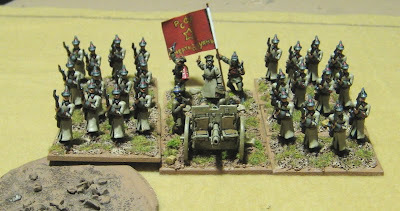 The Tsarists deployment. All of the Rifles are on the west side of the river – deployed opposite my camp. They were obviously hunger and eyeing up all the victuals piled up within! Overview of the initial deployment from the North. The Bolsheviks are on the Nearest (North) edge of the table. The Bolsheviks deployed on the East side of the river – formed into two columns with a battery of filed guns between them to support their march across the vast broken ground to their immediate front. The Bolsheviks deployed on the west side of the river – detailed to protect the baggage. 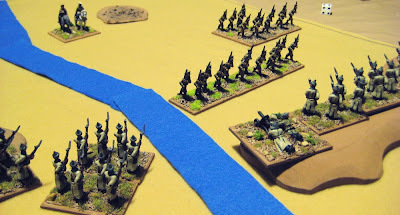 The Tsarist Infantry approach the Bolsheviks defending the baggage! Though some on the right of their line made it to the Bolsheviks (and overran the MG company’s position) to many were shot down in the open as they advanced and the Tsarist forces crumbled and routed! I have settled on a date for the October Campaign Weekend. It will be taking place on the weekend of 2-4 Ocotober 2009. The weekend will revolve around a semi-historical Russian Civil War campaign set in the "Back of Beyond" (Central/East Asia). 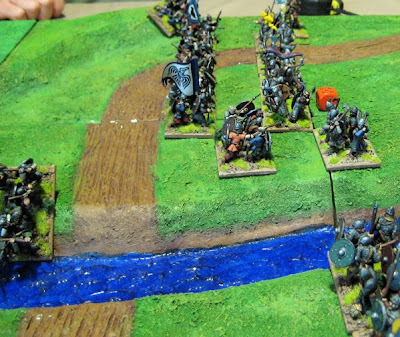 Friday Night – If there is anyone coming from out of town or anyone that hasn’t had an opportunity to play the rules before hand we could get together Friday night to try out the rules and armies. Sunday(?) - possible continuation of the campaign if it is the desire of the players to do so – I imagine it will likely wrap up Saturday evening. So far it looks like Chrisitian, Gary, Rick and Jackson will be in attendance, leaving space for, potentially three more! The Campaign will be played on two different levels. First, the Strategic campaign will be played by using the rules below via email. The players involved will act as the heads of state for the various nations and conduct diplomatic negotiations via email and submit movement orders for their field army once per week (on Mondays). Second, will be the tabletop battles which will be played out using Hordes of the Things at our regular Wednesday night game night. The strategic email campaign will essentially act as a scenario generator for our weekly games night. Each Player will begin with a country consisting of three (or sometimes four) regions, one of which is their capitol. The Regions are linked by designated routes, as indicated on the map . To defend or expand their country players will also start with a Field Army. The Field Army will consist of 24 AP worth of troops. The Campaign will be played out through a number of years. Each year will be broken down into four Seasonal Turns: Spring, Summer, Fall, and Winter. Before each new campaign year Overlords can demand their tributaries supply them with allied contingents to accompany their field army for the year. Then all players will email to me the location of their field army – it must start in a province that the player directly controls. The locations of the Field armies will be posted on the blog before the beginning of the spring turn. During the Spring, Summer, and Fall turns Field Armies may move about, engage in battles, and lay siege to enemies cities. At the end of the Autumn season all Field Armies must retire to Winter Quarters. If traveling by sea each stage must be diced for as per the movement rules below. During the winter player’s tax their people and raise new recruits for their Field Army. Players may add 2AP to their Field Army for each territory under their control, plus an additional 2AP for their Capitol. The maximum size of an army is 24AP. Additional AP cannot be saved or shared, it is lost. At the beginning of each seasonal turn players will email me with orders as to where they wish their Field Army to move. This should be done before 8PM on the Monday of each game week. All are then simultaneously moved according to the movement rules below. Field Armies may move up to two spaces along the designated routes shown on the map .. In some cases the first movement will be determined by the outcome of the previous turn. Field Armies cannot pass through or over an area they do not control unless granted passage by the owning player. All armies which are moving will be moved one space, any armies moving two spaces will make their second movement afterwards if it hasn’t been halted. Armies that “bump into” enemy armies are halted and may move no further that turn. 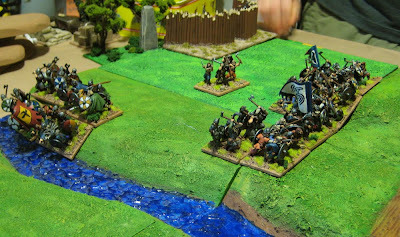 In cases where two opposing armies are attempting to move into each other’s adjacent territories both will dice – the higher moves first and is the attacker in their opponent’s territory. When the Field Army moves all elements must move with the Field Army. 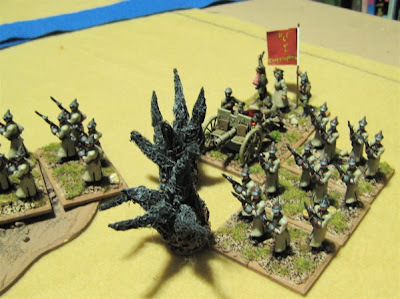 As an alternative to moving a player my elect to “Defend the Realm” in which case they make no movement until all other players have moved one space – they may then move one space to meet an invading army that has moved into the defenders territory. A player’s Field Army is in supply if it is either in or next to a province controlled by either himself or another player that permits him to be supplied. If at the end of any turn (before compulsory moves are made – which are technically part of the next turn anyway) a Field Army is out of supply the player dices and loses 2AP times its score to hunger disease and desertion. When two armies meet it should be determined who is the attacker and who is the defender. In most cases the army moving into the territory is the attacker. In cases where both armies have moved into the same region at the same time the defender is the player owning the territory or the player allied with the player owning the territory. 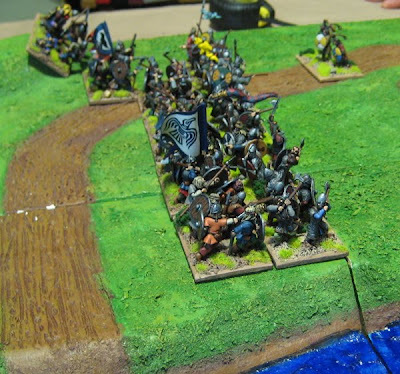 In the case of a Field Army moving into an area to relieve a siege the relieving army is the defender and the besieging player is the attacker. 3) retreat away to an adjacent location and stand a siege without the presence of the Field Army. The exception to this is when an army arrives to relieve a siege in which case the “Attacker” (the army currently besieging the region) has the option of retiring away to an adjacent location, the “defender” (the army arriving to relieve the siege) must engage the attacker in battle if the attacker wishes to stay. If it is not specifically spelled out in the movement orders from the head of state what is to be done in any eventual outcome, the general on the ground (they local players commanding the army on the tabletop) will make a decision. If the Defender (or attacker in the case of a siege being relieved) decides to retreat away from the location it is treated as a compulsory move (just as losing a battle) and the movement counts as the Field Armies first movement of the following seasonal turn. 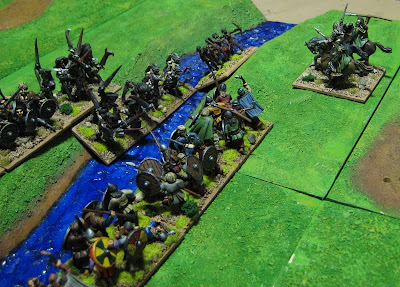 If the defender decides to engage the attacker in battle it is fought on the tabletop using the Hordes of the Things battle rules. Only the player owning the location, if involved, will have a stronghold on the table. Allied contingents that accompany an Overlords army are deployed at the same time as their overlord’s army as part of the Overlords army. Though they are considered part of the Overlords army, the owning player still controls their movements on the battlefield. PIPs must be expended to move them as per normal. Elements of an allied contingent cannot form movement groups with elements of the main army or any other allied contingent. It is possible that more than two armies would end up in the same territory during the same season. 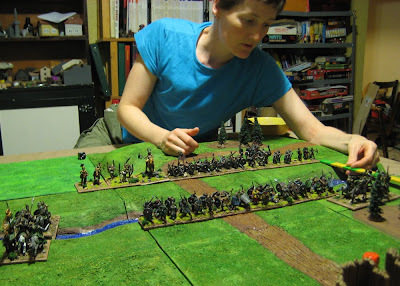 If all players agree this can be played as a Big Battle game where all armies are deployed on the table at the beginning of a battle. Otherwise two primary antagonists should be determined. 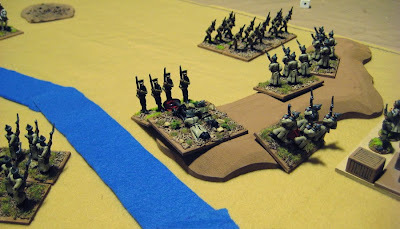 They will be deployed on the table at the beginning of the game and the rest of the armies do not arrive until later. 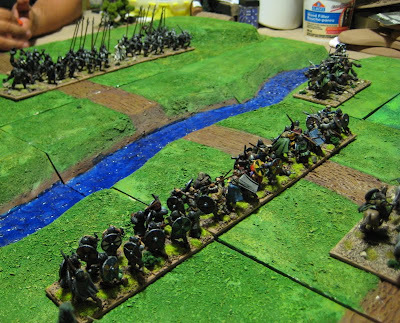 Each army not deployed on the table at the beginning of the game will dice each turn on their sides bound and will arrive when they score 6. Then up to 6AP of that army will arrive in a single element frontage column at the table edge best representing their map route to the battlefield relative to the main protagonists. Further elements can thereafter be deployed in a similar manner at the cost of 1 PIP per element. If an army does not arrive before the battle ends, and their ally has lost, a second battle may be played out between the full army of the late arriving army and the surviving enemies (elements will be recovered before the second battle takes place). The tabletop battle is fought until ended as specified in the battle rules. The losses of allied players are added together when determining whether the side is defeated. Secondary Armies that have not yet arrived do not count towards the sides total AP. 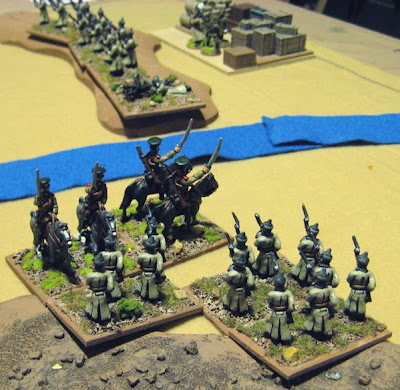 As soon as they arrive the full strength of the army is added to all allied forces for the purposes of determining whether the side is defeated – regardless of how many have actually yet arrived on the tabletop. Loss of a main protagonist’s general or stronghold is penalized by the further loss of an additional 4AP from his Field Army in addition to those destroyed during the battle. This simulates desertion by demoralized troops. The may be diced for and rallied/recovered just as units destroyed in battle as below. 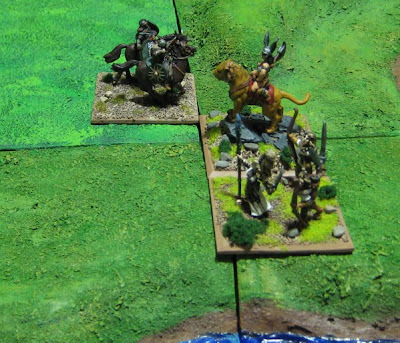 Elements that leave the table and ensorcelled magicians return to the Field Army after the battle. +1 if the battle took place in a territory you owned at the beginning of the game. 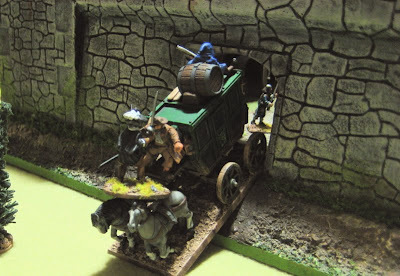 A Hero still ensorcelled at the end of the battle must also make a roll (modified as above) – on a 6+ they escape the clutches of their captor on their own, otherwise they are taken to the bespelling magician’s nearest stronghold, and cannot be recruited back or its AP used again unless voluntarily released by it’s captor, rescued by the capture of that stronghold, or desorcelled during battle at that stronghold. If the player owning the province fought over is defeated, the province and it’s stronghold are captured by the opposing main protagonist without any further siege. A defeated Field Army must retreat to another of it’s own provinces. If it cannot it may retire to the province of an ally that permits it to do so. If it cannot do either it is destroyed. The retirement move is considered a compulsory first movement segment of the following turn – or part of the Field Armies retirement to winter Quarters in the case of a defeat in an Autumn turn. After a battle, each player gains one prestige point for each AP his troops have destroyed or forced to recoil or flee off-table in excess of those of his own elements that have been destroyed or forced to recoil or flee off-table. This is done BEFORE rolling for recovery of troops. A player who captured an enemy stronghold during the battle or whose troops destroyed an enemy’s General gains an additional 4 prestige for each such instance. If the defender elects not to fight a battle the province’s stronghold is besieged. To determine the outcome of the siege the attacker dices. He must score 6 to capture a stronghold in which an enemy Field Army is present, or 5+ in an enemy Field Army is not present. If a captured stronghold contains the defender’s Field Army, the whole army is treated as though it was destroyed in battle – all elements may be diced for as per units lost in a battle above and any survivors must retire just like an army defeated in battle. If a besieger fails to capture the stronghold he loses 2AP of his choice from his own Field Army (not an allied contingent). The Siege continues next season unless winter intervenes or the besieging army moves or is defeated in battle. The score needed for capture reduces by 1 each season the siege lasts. A Field Army that has accepted a Siege can sally out in it’s next turn to give battle, but not retreat without battle. A player can ask at any time to become the tributary of another, who, if he agrees, becomes his overlord. A tributary cannot invade another country without the consent of his overlord and must at the beginning of each new year provide an allied contingent (of up to 6AP) to accompany his overlords army for the year if ordered to do so. Neither can attack the other while the relationship lasts. 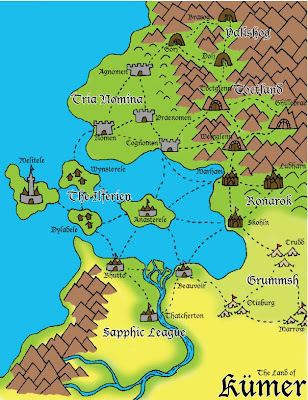 A player whose capitol is taken normally automatically becomes a tributary of the conqueror. The tributary retains control of his capitol and any other provinces yet remaining to him. If however his race is completely inimical to the conqueror’s he is instead knocked out of the game. If so, his field army disperses and his remaining provinces become independent until successfully besieged. Field Armies cannot enter or pass through such an independent province except to besiege it. 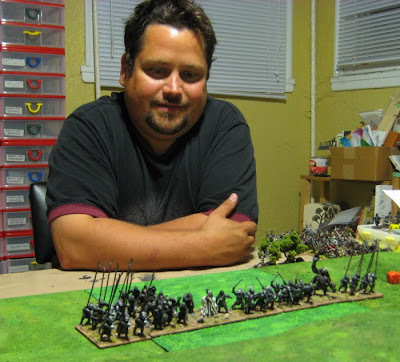 A Player who himself is or becomes tributary can retain or acquire tributaries of his own, and can order these to provide a contingent o support his own field army or provide a substitute contingent for his own overlord. A player cannot have two overlords. A player whose overlord loses his own capitol or two consecutive field battles can renounce their tributary status and regain his independence. A play may cede territory to another player this may only be done over the winter and must be done before initial dispositions are declared for the spring. Players cannot cede their capitols to any others, nor may they cede territories without the consent of their Overlord. When the time limit has been reached, each player counts as his score the prestige points he has gained in battles, 6 points for each province now directly under his personal control, and 4 points for each of his direct tributary’s provinces. A player who is knocked out of the game before then gets no points for provinces, but retains his prestige points. Head of State: Myrah the Mighty, Chairperson of the Council of Empowerment of the Sapphic League of Unity and Togetherness. let the Diplomacy and trash-talking begin!! It’s Going to be a HOTT Fall! This fall I am running a Hordes of the Things campaign for friends both near and far. It will kind of work on two different levels. First the Strategic campaign will be played by friends who do not live in Saskatoon. They will act as the heads of state for the various nations involved and conduct diplomatic negotiations via email and submit movement orders for their field army once per week (on Mondays). 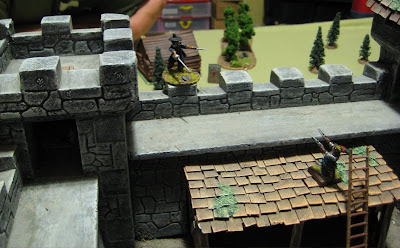 Second will be the tabletop battles which will be played out by those that do live in and around Saskatoon at our regular Wednesday night game night. The strategic email campaign will essentially act as a scenario generator for our weekly games night. I’m just working on a good copy of the map right now and sorting out who is playing which nation. Stay tuned for regular campaign updates! The map will be done in the next couple days, armies deployed next week, and the first campaign turn begins the following week!! Oh and the strategic players aren’t going to know who each other are… (all correspondence will be filed through me!). So if you’re playing in the strategic campaign and commenting on this blog – please try to not give away who you are playing!? Inspired by watching Generation Kill (which Christian leant to me) and the desire to be able to say “I am DONE those!” I finished off the last four 28mm Modern Military figures I have! Oh, I do have some more 28mm Modern/Near Future Civillians and Superheros types… but all the Military ones are done. That’s also not to say that I won’t ever add to them – there’s a number of things I’d like to add at some point, but given the moratorium on further figure purchases until next year… that ain’t going to happen any time soon. These are some Ultra Modern Russians. The infantry, as above, are all from The Assault Group. The BTR-80 is from S&S Models. 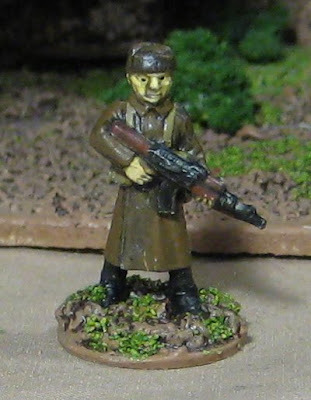 These Cold War Russians are from Mongrel Miniatures. They sometimes see action with the Ultra modern types above. 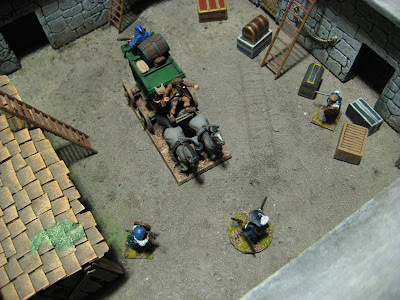 These East Germans are also from Mongrel Miniatures. I’ve had this figure since the late ‘80’s/Early ‘90’s and I have no idea who manufactuered it or where it even came from!? I so wished I could have found more because I was playing a lot of Twilight:2000 at the time… I should give him a Pinsol bath and repaint him to more closely match my other Cold War Russians. These Afghans are mostly from Devil Dog Design, though the stinger team on the left is from Mongrel Miniatures. Some Cold War British SAS (from Mongrel Miniatures) – two teams worth. More Cold War British; On the left are four Gurkhas from Gripping Beast’s MoFo line, while the platoon command and support to the right are from Mongrel Miniatures. A handful of Americans. The four on the left are from Devil Dog Design. The four on the right are from Gripping Beast. The one in the middle is a converted Copplestone Castings mini. A fireteam of Canadians. The four with helmets are from Devil Dog Design, the other fellow is from RAFM. Not Military per se, but 28mm, Modern, and DONE! (and close enough to Military…!) The five on the left are Copplestone Castings, the remaining eight on the right are from The Assault Group. I’d like to add some more vehicles at some point… a T-72 perhaps, maybe some Soviet APC/IFVs from Sloppy Jalopy - they’d be most handy as they could be used by any number of forces equipped by the Eastern Bloc. Some British Tanks and/or APCs to support the British infantry I have would be nice. 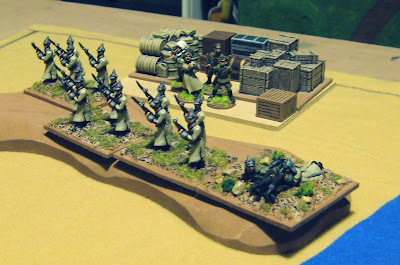 I’d definitely like to finish up the better part of a British Cold War platoon… pick up some more Cold War Russians (more VDV and some Motor Rifles) and some Argentines for them to fight…. 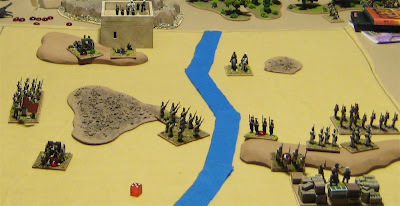 I’d like to get some Generic African Militia… and maybe some mercenaries…. More Arabic types… and perhaps some Middle East regulars…. Now if only I could finish off the 28mm Modern Civilians and Superheroes! (not to mention all the Kiss-Kiss, Bang-Bang figures I picked up….). Maybe that should be the carrot – once I’ve finished painting all those I can pick up some more Modern/Cold War Military types!? This past Sunday my friend Curt came up from Regina and put on a game for me and some of the other locals. John, Christian, and Amanda also played, Mr. Miller showed up later and heckled. “The Duc d’Urbanville, a French nobleman, is acting as an emissary for the people of his region to the king of France. He is what some people term “a complex man”; he is a Basque, a Huguenot, a gambler, a rake, a duelist and somehow not surprisingly, a defrocked ex-priest. Nevertheless, due to his high birth, wealth and social station he is also an extremely powerful man, and though hated by many he is courted by the elite of European society. “Though d’Urbanville carries a Royal Seal giving him great latitude while he makes his way to Paris, he has decided for the sake of security to travel quietly with his son, his household staff and a modest retinue of Scots mercenaries. In order to better facilitate the negotiations with the French king and his papist Cardinal d’Urbanville has brought along several Catholic relics and other gifts to present to the King’s household. 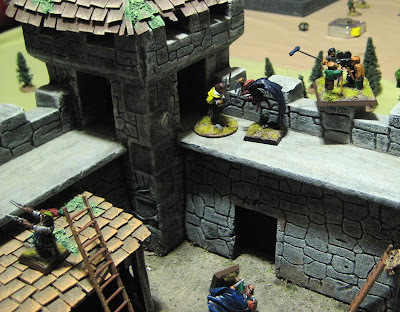 D’Urbanville and his party has stopped at a small village with an ancient keep, as it is the final way-stop for quite some distance. This was Christian’s character…. He was out for vengence and had to take out the Duc’s son. He took a little time to get into the game but ended up the overall victor – claiming top billing for the movie! It kind of backfired as I called in the camera and skillfully dispatched the foes garnering me a huge pile of EGO points! 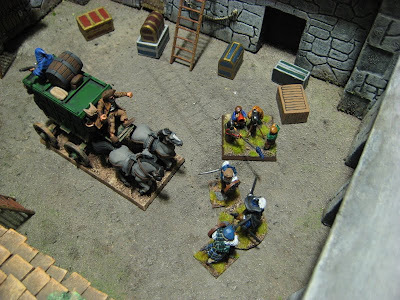 Amanda’s Character entered the scene with a rather fabulous stunt – involving swinging down from the tower on a rope – building her EGO considerably – meanwhile my character jumped up on the coach and started battling the driver! The Driver started driving away but I managed to stay aboard and dispatch the driver! 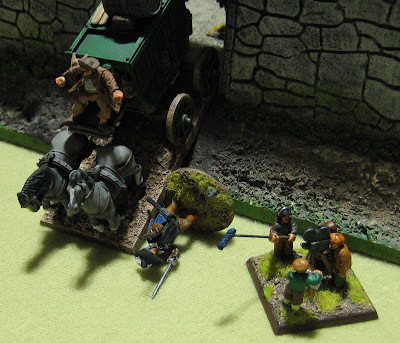 Then I tried to gain control of the coach while simultaneously duel the man with the blunderbuss sitting on the back – TWICE I failed at this – both times on camera which got the director really mad and reduced my EGO points to ZIP!! John’s character taking out the Duc’s Assasins (one is already lying in the courtyard below having been kicked off the ramparts when John made his spectacular entrance. Christian’s Charcter finally joins the action and who should he happen to meet on the ramparts but the Duc’s son – whose cheeks he carved his initials into before throwing him off the roof of the shed – all on camera – boosting him instantly into top billing for the flick! He further blasted our names right off the poster by later kidnapping the Duc's mistress! Amanda’s character (in blue) dueling with the Duc (in red, of course!) himself. She too was out for vengance as he had ravished her when she was younger… unfortunately the film ran out and she never got to finish him off in this film… perhaps there will be a sequel!! These Ninja are, like the one in the Previous Post, are from Old Glory. Wait… where the heck did they go!? 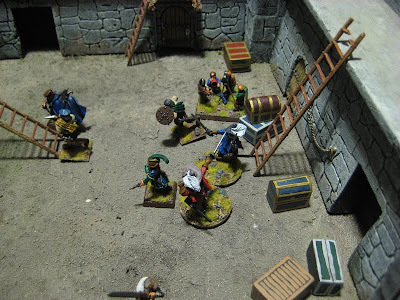 Tricky, tricky ninjas… These lot are for skirmishing…. 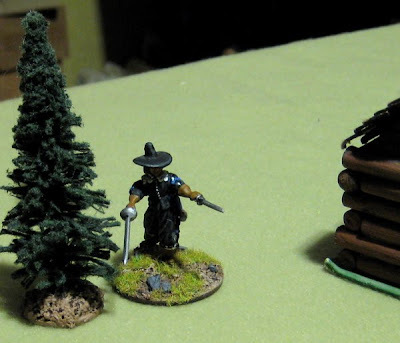 On the left is an old Games Workshop/Citadel Minatures Oriental Wizard and on the right is a Ninja from Old Glory. The Wizard I’ve had forever, but just never seemed to get around to finishing him off. The Ninja is brand new – CVT brought a bag as partial payment for the Anglo-Danish I painted for him. 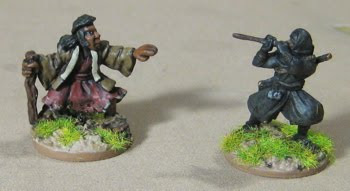 They join a modest group of Oriental Adventurers… Though there shall soon be more! 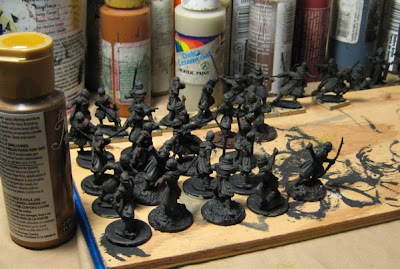 For one, I have another THIRTY ninjas on the workbench (somehow they’ve bumped the Romans!?). Now I know what you’re thinking “Who needs thirty Ninjas! ?” and all I’ve got to say to you is – Who DOESN’T need thirty ninjas!!! I mean you can always add ninjas to just about any setting to make it super-cool! In addition to the ninjas, CVT ordered me some Old Glory Samurai from WarWeb.com - enough to make a DBA army and a couple left over for skirmishing. Does it get any better than this!? Over on the left there you will see a page element titled 2009 Totals. I originally got the idea from Patricks Hobby Shed. So last year I started keeping track of how many things I’ve painted. It was kind of fun to keep track of how much I actually cranked out. So this year I added “figures purchased”… This was to keep track of how many toys I actually buy over the year and to be able to compare it to how much I’ve painted. I’ve been doing pretty good so far – painting far more than I’ve purchased… well… up until a couple weeks ago…. To date I have painted 601 foot, 100 mounted, 2 vehicles, 3 artillery pieces, and 5 buildings or strongholds – these are all for 28mm figures. Up until last week I had purchased 366 foot, 61 mounted, 3 vehicles, 6 guns. A fair chunk of them are GW plastic figures I picked up off of ebay. I’ve seen some others that do similar things, like Neldoreth’s at An Hour of Wolves and Shattered Shields. He’s taken a slightly different approach that I really like – instead of purchased and painted he’s just kept track of Unpainted Figure Totals. I’d like to do something similar, perhaps an annual figures painted vs. figures unpainted total – broken down by period/scale/etc. My good friend Chris was in town this past week visiting from Edmonton. 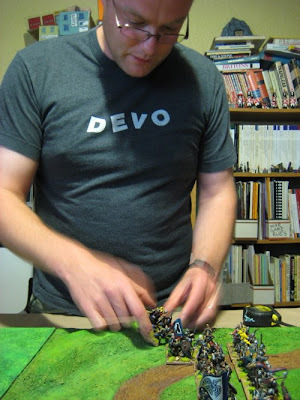 WE got in a few games of Hordes of the Things and DBA while he was here. On Tuesday evening He, Amanda and I played a little “round robin” of HOTT games. Amanda took her “HOTT Chicks”, I played an Army of Rohan, and Chris played the Uruk-hai. First I played Amanda – Chris wanted to watch a game to help remind him of the rules, and Amanda wanted to play her games first so she could go to sleep earlier. 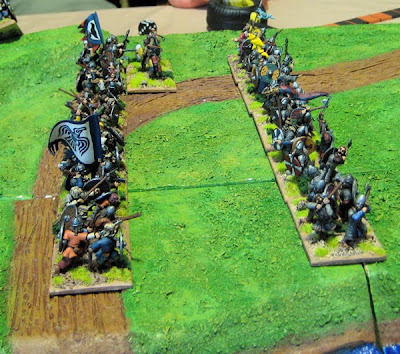 The Shieldwall of Rohanian Warriors advances to defend the River while King Theoden leads a column of Riders across the river to flank the Sapphists. 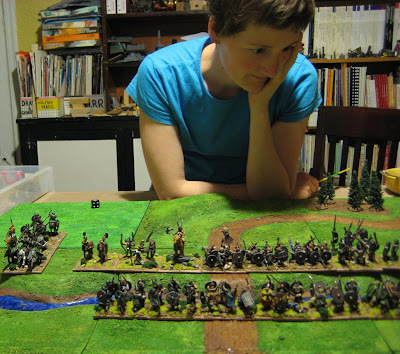 Amanda contemplating the tactical difficulties of attacking across a river. The column of Riders makes it across and makes contact with some Centauress outriders on the right of the Sapphists line. The Centauresses are quickly driven off! 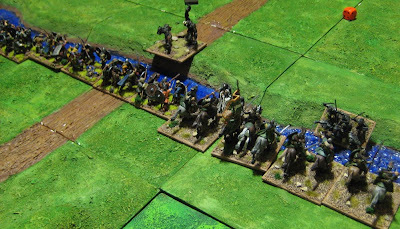 The Sapphists archers drive off the reserve of Riders that galloped to Rohan’s own right flank where it looked like the Saphists might try and force their own way across. Queen Libby and the Elven Sorceress Amandalyll move to meet the Riders Threatening to roll up their flank. It is an epic battle. 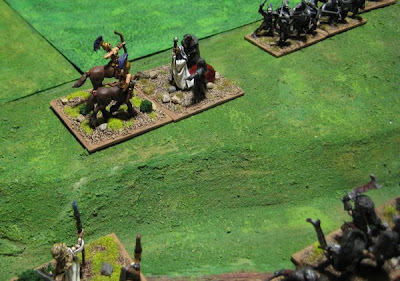 The archery of the Sapphists wipes out one unit of Riders and continues to force the others back – they try to force their way across. It is not necessary because the enchantress enscorcels King Theoden while her queen ans entourage exact a heavy toll on the King’s Riders… the Army of Rohan breaks and routes off the field in panic! Next Amanda battle Chris – and this time it was the Sapphists defending their lands against an invasion by the Uruk-hai of Isengard. The Sapphists arrayed for battle – ready to defend their lands from the forces of tyranny and lack of hygiene. Chris and his army of Uruk-hai on the warpath! 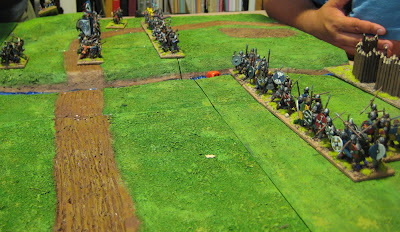 The lines steadily advance to meet each other on the hill that dominates the center of the battlefield. The Sapphists line is broken up and slowed by ambushing lurkers behind their lines. 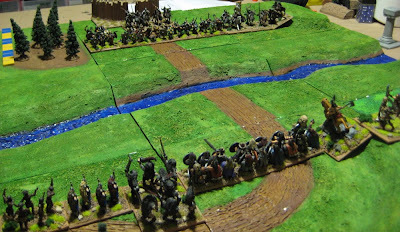 This too was a short battle – Queen Libby fell, but the Sapphists carried on as they had already wiped out two units of Uruk-hai pike and felt that all was not yet lost. When these Centaurs were wiped out by the magic of Saruman, however, the Sapphists left the field and retired deep into their wooded realm. Finally Chris and I duked it out – he was attacking so I set up the river again and the Uruk-hai attacked at the Fords of Isen.. The Rohan sheildwall advances to defend the fords. The Army of Isengard advances spreading ashadow of doom over the land! 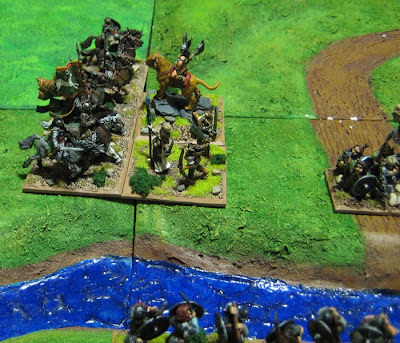 Scouts and Trolls try to force their way across at the Ford, but are repulsed. 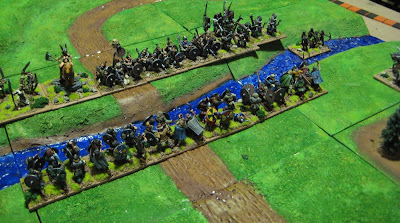 The rest of the Isengard line wades the river. 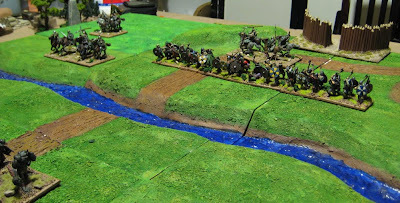 A unit of Riders are defeated on the banks of the River Isen! The tide quickly turns, however, and the Uruk-hai are slaughtered where they stand! 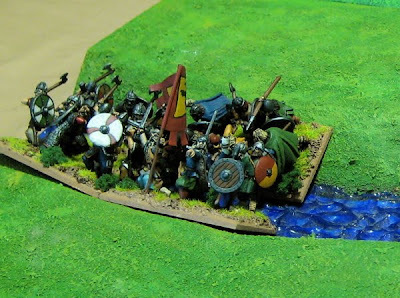 The Anglo-Danish deployed astride a river… apparently “attacking” the Vikings!? The Vikings apparently are of the “Best-defence-is-a good-offence” school of thought! Making their way across the river. 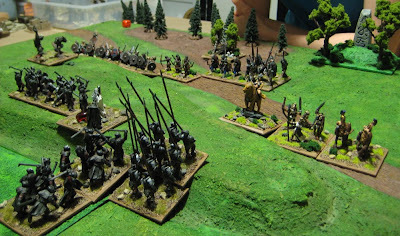 English skirmishers harass the Viking lines. General Knudsen advances his troops! The lines finally meet with a thunderous crunching or shattered shields and rended flesh. But first I’m going to finish off the Romans – I made some headway while watching episodes seven and eight of Season Two last night, tonight we shall finish the series, and I should be pretty close to finishing the army…. Tomorrow my friend Curt is in town and is going to be putting on a Swashbuckling Musketeer game of some sort… stay tuned for the report of that as it’s sure to be a gooder!